Bluecross slide-out rack-mount panel provides a simple, high-density, low profile solution for easy access and management of fiber optic terminations in a one-rack space design. The rack-mount sliding tray panel accommodates up to 12 & 24 fibers in ST, SC, MTRJ, LC and FC connector interfaces in 1U Model and 48 fibers in 2U Model and son on. 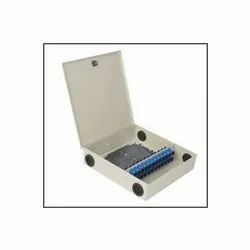 The sliding-tray is equipped with slack-fiber storage spools, and comes complete with a number of cable management devices for organizing cables entering and exiting the panel. Splicing tray is also provided in the sliding tray. Has provision for up to 12 fiber splices. Splice holder tray with plastic grooves is also provided to securely hold cables/sleeves. Front Slide-Out Panel design for ease of Installation, inspection and testing. Compleate aluminium housing, fully powder coated . Rubber grommets are provided at the cable entry point for tight sealing . Fully cushioned splice holder containing grooves for protecting sleeves . Stackable design, sufficient room provided for storage of excess cable . The fiber spools provide minimum bending radius. Bestnet offers Light Interface Units which are very easy to install and provide total solution for routing, terminating and organizing fiber optic cable terminations. The LIUs have 4 spools and splice holder trays upto 12/24 splices and mounting hardware as integral parts. Wall mount models in user selectable capacities from 1 to 96 ports are available along with a range of accessories. Adaptor plates for connector mounting are available in ST,SC,LC,FC & MTRJ Duplex/Simplex, connector varieties. These plates are designed for easy mounting using push-fit lockable knobs and can be easily mounted in vertical configuration. Bestnet wall mount unit is light weight and easy to install. 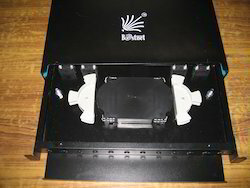 This unit is a compact housing allowing both splicing and connecting fiber optic cables. It can splice and terminate 12/24 fibers using 6-fiber panels. Accommodates up to 24 ports. Key lock provision to restrict access to authorized personnel only. Cable entry option from all four corners, top & bottom. Two-compartment construction provides for grouping and arranging cables. Spools provided to wind and tie tidily any length of fiber as desired. Holds up to 3 Adaptor panels. 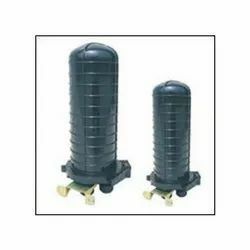 Bestnet 2 way in / 2 way out outdoor fiber optical joint enclosure, with 12, 24, 36, 48, cores capacity dome (vertical) type. Plastic body, metal shelf ,fiber splice tray, airtight materials, heat shrinkable protecting tube,hang tools etc in set. The casing is made of high quality ABS, compact and lightweight. Logical design, waterproof structure, easy installation, convenient maintenance. Easy to re-enter, it never requires re-entry kits. Elastic seal fitting , easy for future capacity upgrades and re-enters. Insert plates and fixing bolts are used for fixation of closure. 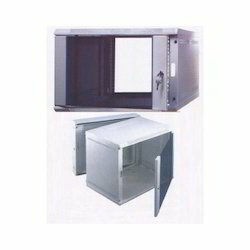 These enclosures are designed for similar applications, it can be used at a smaller offices and also at any small spaces. Its applications are so vivid where you can house patch panels, hub, audio equipments and networking system etc., It can take a maximum load of 50kgs. Cooling fans & fan tray.